← Q: When should I start to discipline my toddler? Q: When should I start my baby on solids? Question: My baby is nearly four months old and I’m breastfeeding. I have been given conflicting information about when to start giving my baby solids, and I am confused. When do you recommend I start introducing solids, and are there any special foods that I should begin with? Answer: The World Health Organisation (WHO) recommends nothing but breast-milk for the first six months of your baby’s life (If you are bottle feeding, follow the instructions on the can to determine how much your baby should be getting). Around six months your baby will probably start wanting to experiment with solids in tiny but increasing amounts. Meanwhile you can continue to breastfeed, if possible up to at least two years of age, and longer if you wish (recommended by the WHO) as breast milk is the perfect food for babies and toddlers. (See article on breastfeeding). Some babies will give you clues when they are ready for solids, by trying to grab food from your plate at around six months. Others are just not interested yet, though they might be willing to have tiny tastes of what you are having. That’s not a problem if you are breastfeeding, as their main nourishment for the first year or so is still your breast milk. 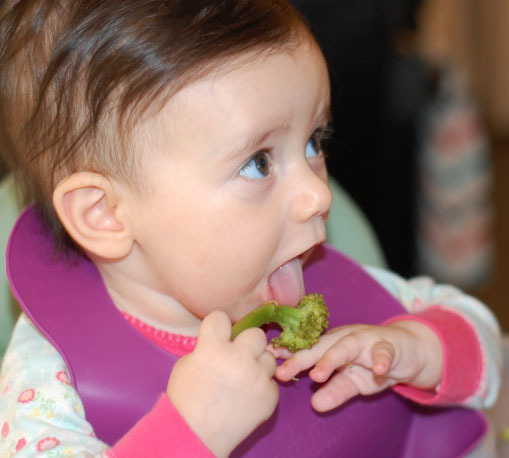 The latest method being recommended is called Baby-led Weaning. Previously mothers started giving either commercially prepared baby foods or made the foods they were eating into a thin purée. This was spooned into the baby. As the baby got older, more lumpy foods were given, to prepare the baby for being able to chew. Some babies took to this fine, but with others, spooning foods into them (especially if they didn’t like the taste), often developed into a battle, and mothers became anxious that their babies weren’t getting enough. Trying to force food into a resisting baby can also carry the risk of leading to eating disorders later in life. This up-to-date method introduces healthy foods to your baby in such a way that he can choose what he wants without meal-time battles. From about six months, when you sit down to a meal, put your baby onto your lap or into a high-chair next to you. From there he can reach out and start taking finger foods from your plate or you can place them on his high-chair tray if you prefer. Give just just a few choices at first and avoid putting them into a bowl, as he may mistake this for a toy that can be thrown across the room. Since he has already reached the stage where he is probably putting things into his mouth, he will copy you and do it too. So you can have all kinds of suitable foods, if necessary cut into pieces, within his reach. They should be shapes that he can hold onto securely while experimenting with them. Cooked carrot sticks, pieces of broccoli with a stem he can grip, and soft fruits like bananas or slices of mango are just a few of many that work well. Handfuls of mashed foods like potato are fine so long as you don’t mind cleaning up the mess afterwards. Never leave small objects like peanuts within his reach as he could choke on them. With conventional puréed baby foods, your baby learns to swallow first, and then chew. That works fine until you introduce textured food with lumps in it, as he doesn’t know what to do with them. With finger foods, he learns to taste first, then chew and then swallow so don’t be concerned if he just licks and tastes at the beginning. He is a little scientist doing an experiment – learning about what foods are, how to eat them, and which ones he prefers. If you are eating healthy food, he will get healthy food too. Left to his own devices, by the time he is a toddler, he will choose the right foods, as he will be able to feel what his body needs. Some parents are concerned that giving babies finger-foods might be dangerous. However, babies weaned using the baby-led method are actually less likely to choke on their food because they are not able to move food from the front of their mouths to the back until they have learned to chew. In turn, they do not learn to chew until they have learned to grasp objects and place them in their mouths. So they start feeding themselves when they are developmentally ready. At the beginning, your baby will just experiment with things to discover which ones taste nice to him. Since the flavour of the food you eat gets into your breast milk, your baby is already familiar with the taste of the foods you eat regularly. If he likes the taste of something he has discovered, he may reach out for some more. If he doesn’t, he will reject it. It’s fine to ignore that. He may come to like that particular food later. So long as you are offering healthy foods, and never replacing a milk feed with these ‘adventures’ at the table, your baby will get plenty of good nutrition. As he gets older and takes more and more solid food, he will gradually take less milk from you till he has his final feed, which may be at two or three, or even later. The weaning process happens so gradually you hardly notice it, till one day you realise he hasn’t nursed for a week. I learned about baby-led weaning many years ago by watching my friend Anne, who just did it instinctively. From about six months of age, she placed her babies on her lap, starting with the evening meal, and let them help themselves from her plate. The younger one started reaching for food at around six months of age, though the older one hadn’t been very interested till quite a bit later. But she sat him on her lap in the evenings and just let him be there anyway, watching things, picking up items, and licking or tasting them. When he got going, one of his first favourites was ripe raw tomato, sliced thinly and easy to chew on with his gums. The other one was meat. He would put small pieces into his mouth, chew the juice out of them, and then store what was left in his cheeks till they bulged. His parents laughed and called him their “little hamster”. When his cheeks couldn’t hold any more, I noticed that his mom quietly held out her hand and he spat the meat fibers his gums couldn’t chew, into it. Nobody made an issue out of it, so there were no tears, upsets or food battles. Today he is a grown man who has perfect table manners. Both of them eat very healthy foods, including lots of salads, vegetables and green smoothies. The articles on this site are copyrighted and may not be reproduced anywhere without the permission in writing of the owner of the site. The images on this site are from various sources. Our appreciation to everyone who has kindly given their permission for us to use their images. If we have inadvertently violated any copyrights, please contact pgt@mweb.co.za so that we can address the situation. This entry was posted in FAQ and tagged breastfeeding, childrearing, help, nutrition, parenting questions answered, weaning. Bookmark the permalink. Thank you so much for this article! On the advice of family, I started giving my son rice cereal. He loves it! I think it’s time to start introducing some solids. But, is he ok to try baby-led weaning since he’s already had exposure to pureed food? Hi Jill, If your baby is around six months or older, then introducing baby-led weaning is always a good idea. I hear you that your baby loves rice cereal. The reason rice cereal is promoted as being the first food to give to a baby, is that of all the cereals, it is the least likely to cause allergies. The only problem with rice cereal is that it is pure carbohydrate and has almost no nutritional value and can start a dependency on refined carbohydrates. You say he loves it, so taking it away from him might really upset him but if you sit him on your knee at mealtimes and let him eat tiny bits of the good, nutritious food you are having, then he might lose interest in the rice cereal without even noticing it wasn’t there any more. If he still wants it, one way to make it more nutritious would be to mix it with expressed breast milk rather than water. About cereals in general, the later we introduce them to a baby the better, though if you normally have them for breakfast, when your baby is old enough to eat what you are eating, then they probably won’t do much harm. Nutritious foods are fresh or cooked vegetables and fruit, and if you are not a vegetarian, meat and eggs as well. Your baby can start having tidbits of those from your dinner plate (or any other meal you are having) as soon as he starts showing an interest in what you are eating. At first he will only want to taste them, but if he likes the taste he will start to chew them and then finally swallow them. I hope this helps and feel free to keep in touch.